SPONSORED LINKS Mateo Bano a grade 3 pupil from J.Blanco Elementary School in South Cotabato tagged as hardworking student after his viral photo circulating online, wherein he is able to go to school not to missed his classes by bringing his own brother to school. 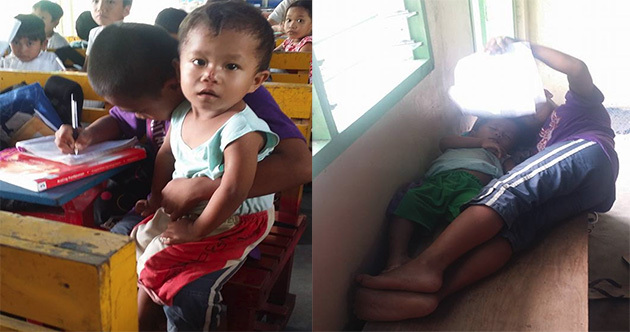 Teacher Shyla uploaded his picture to ask for help especially to Government organizations who can help Mateo and his family on their current situation. Isa to sa mga pupil namin... His mother pass away last year due to ectopic pregnancy. Dahil walang mag-aalaga sa kapatid nya dinadala nya nalang ito sa klase para di maka absent... Ang tatay nman ay naghahanap buhay kaya hinahayaan nalang namin... Pinapakain nalang namin sila sa school pag lunch time para di nalang umuwi tuwing tanghali... Hopefully may mga mabubuting puso dyan na tutulong..
Other extended their help thru text messages to send some amount, other gave 500 pesos and many upcoming donations for them. This story touches the heart of netizens and if your one of them feel free to SHARE this for help. Any donations will be accepted directly to this LINK.